Nobody knows nothing. The data, cooked and contrived as it is, gives no definitive answer. The bulls think the economy is mending but ever so slowly. The bears think the economy is taking on water and bound to sink like the Titanic. Investors are clueless and there is an election a few days away. Bernanke described the current conditions very well with his ‘unusual uncertainty’ reference a few months ago. We are all guessing. Which way is Bernanke guessing? SuperBen emerged from the Jackson Hole retreat at the end of August hell bent on another round of quantitative easing. In layman’s terms, quantitative easing is when the Fed snaps its fingers to conjure dollars with which they then buy US Treasuries from the shill banks that are required to buy the debt issuances of the US Treasury. Obviously the idea is to stoke the economy by pumping trillions into the banking system. Banking voodoo quickly turns a trillion into ten times that with the lending power of nine. The Fed would not consider doing such a thing unless the economy was in critical condition. Point taken. The poor old US dollar, though, is in for a shellacking if the Fed pulls a trillion out of its derriere. Sure, the Fed pretends that creating dollars from a mouse click in a spreadsheet isn’t really increasing the dollar supply but who’s kidding who? Since their inception, the Fed has destroyed the dollars value. In fact, they have substituted the Federal Reserve Note for the Dollar Bill. The Federal Reserve Note is a promissory note. It is a debt instrument in and of itself. It has no value whatsoever. But this is the Fed’s con game. But what about inflation? Most people associate inflation with currency devaluation. Indeed, as the Fed has increased its balance sheet by creating electronic dollars to buy Treasuries, inflation has accelerated. Commodities of all types are on the rise and will likely continue the upward trajectory with more quantitative easing. Most people who believe inflation is rising also believe gold is a hedge against inflation. However, that’s not entirely correct. Gold is more of an alternative to currency. In fact, gold and the dollar are like a marriage. 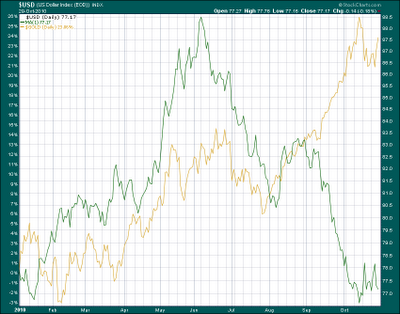 I included the chart below which is a year-to-date look at gold and the US dollar. The fact is, the two climbed in harmony (the chart is not meant to be of scale) until Bernanke emerged from his hole at the end of August. Suddenly, it seems that gold and the dollar have filed for divorce. The moment Bernanke brought up the subject of QE2, gold and the dollar went their separate ways. The driving force in the separation is not inflation or even monetary supply. The driving force is the Fed. They are the fornicator. What does the chart imply as we move forward? It all depends on QE2 and how much Bernanke pumps into the banks. If he goes for a trillion or so, gold looks poised to rocket higher. If blundering Ben disappoints investors with less than $500 billion, the dollar may find footing and gold may tumble. Whatever you invest your money into, pay attention to Ben. He is the ruler of Wall Street and whatever he does will have an instant impact. A big QE2 should be good for gold and bad for the dollar. Divorces are always an ugly matter. America has become an asterisk. That means it only exists conditionally. The conditions are explained by asterisks. For instance, big banks earn a lot of money as long as minor details like expenses, losses, and derivative valuations are ignored. The governments car company, GM, will soon release an 'electric' car that gets 280 miles per gallon equivalent. However, it is not really 'electric' as it has a small gasoline motor and at highway speed, the motor kicks in. In truth, it will return mileage equivalent to a Toyota Prius. Only, the US taxpayer will have to chip in about $7k per car sold to even make it seem competitive. What about the stock casino? Well, as long as the Fed is hard at work every day manipulating the indices higher with POMO or TOMO or PPT activity, the casino appears to the dopes of the world to be a 'market'. Without the Fed, it's a yard sale and everything must go! Monday was a POMO day. Tuesday was not. Wednesday was. Thursday was not. Friday was. Check the charts. Charts don't lie. Governments do. The US government was overthrown in the coup of '07 by the Federal Reserve. The Fed is now cementing its power of control with the tool of debt. It's not like they are acting in a clandestine manner. It's all in black and white. The Fed's own balance sheet lists a sum of just over a couple of trillion dollars for total assets. A trillion of those assets are MBS (Mortgage Backed Securities) paper that they are using to steal $2 trillion in Treasuries from intellectual Treasury caretakers like Bernie Frank, Nancy the nitwit Pelosi, and the rest of the feckless Congress. That MBS paper has an asterisk beside it. The corresponding footnote says that the trillion-plus MBS paper is all backed and guaranteed by Fannie and Freddie. I can't imagine a reader of this blog not knowing this but Fannie and Freddie is you and me - the taxpayers. The Fed has no risk in the bad mortgage paper. None. You can read my article entitled 'The Fed's Furtive Filching' that is posted on sites like www.financialsense.com but the outcome is sealed. The banks had bad mortgage paper in 2008. They lost all of their money in derivatives trading based on the bad mortgage paper. They were, and still are, bankrupt. Yes, I know. They all report good profits. Go read the asterisks. So the Fed engineered the greatest theft in history. They got Congress to sign over a few trillion in Treasury notes so the Fed could issue the banks a dollar for dollar exchange of Fed cash for bad mortgage paper. Now the Fed has bad paper, the banks have Treasury notes, and the taxpayer has debt. The Fed is now buying Treasuries from banks to complete the heist so they can replace the bad paper with good Treasury notes. Very soon, the Fed will have converted a trillion in bad mortgage paper into a trillion in Treasury notes, the banks will have converted a trillion in bad paper into Federal Reserve Notes, and the taxpayer will have converted stupidity into an extra trillion in debt. Watch the asterisks. They are important. In other words, housing starts could have been up 10% or down 10% or anything in between. Who knows? Anyway, the market needed a positive number so it got one. Well, it came with an asterisk! Meanwhile, every country continues to fight currency appreciation versus the terminally cancerous US dollar. China raised interest rates slightly to try and dampen economic growth thus lessening the yuan appreciation. Brazil imposed higher foreign taxes to bond purchasers outside of Brazil as did Thailand and other sovereign nations in a effort to dampen their respective currencies appreciation versus the US dollar. It seems that there is a flight from US dollars as the current US administration continues to scare the bejeepers out of the rest of the world with a continued maniacal economic policy of borrowing, lying, and surrendering to the central bank. Even the US debt comes with an asterisk. The debt is not very large compared to GDP unless of course you have the audacity to also count off-balance sheet expenses and unfunded obligations into the tens-of-trillions. 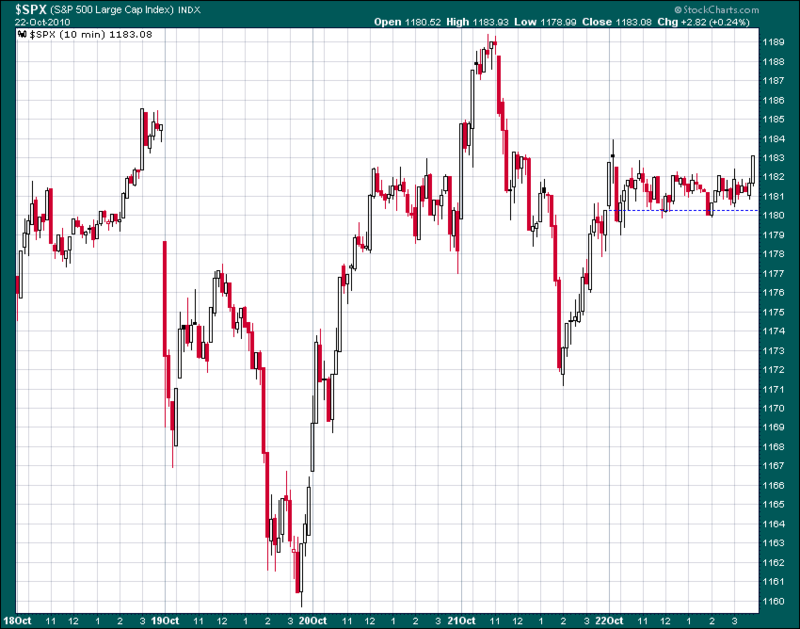 Let me leave you with a chart of the SPX for this past week. 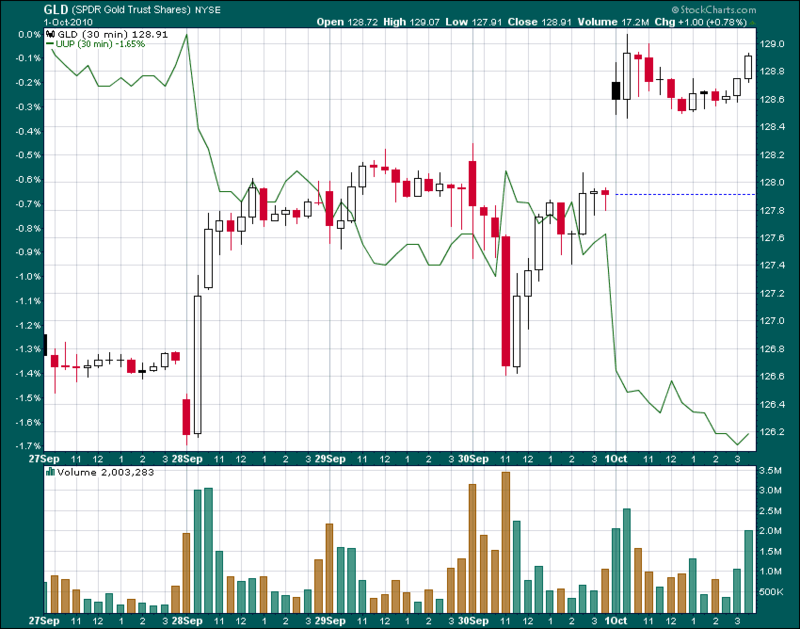 The chart is the last five days showing 10-minute bar intraday trading. As you can clearly see, the POMO days were positive. In case you are interested, next week looks promising with POMO days on Tuesday and Thursday. Also, the Treasury will be issuing over $100 billion in new debt so that should drive the greenback down. Combined with POMO intervention and manipulation, the dissolving dollar is likely to push the indices higher. Just don’t forget to watch your asterisks. These are the riskiest indices in history. Why? They are all based on an asterisk. Yippee! 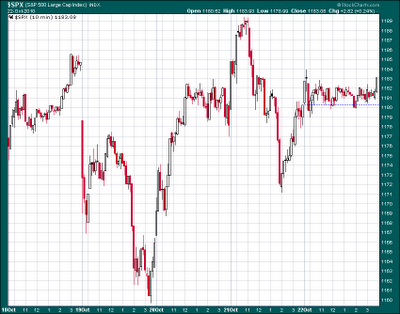 SPX - 10/18//10 - 10/22/10 intraday 10-min bars. The stock rally stalled this week when banking stocks stumbled. in 2008, it was the 'toxic illiquid assets' that stopped up the system. in 2010, it is the stampede of foreclosures on that toxic illiquid asset mess that has stopped up the system. Over the past couple of weeks, the banks agreed to halt the foreclosure process across the nation. Seems that no one quibbled about the fraud in lending on the front side of the sales process. Now everyone is upset about the fraud on the backside of the foreclosure process. Or maybe the government just didn't want a million foreclosures in the year to show up in dispute of a well publicized and much cheered economic recovery. The fear is that the mortgage paper absorbed by Fannie and Freddie might get sent back to the banks if the foreclosures are not legitimate. Yes, there are a lot of problems from bad signatures to missing paperwork. This could cost the banks billions. Also at stake is the idea that banks that extend loans must retain the right to evict when payments are not met. As the foreclosure lines get longer and longer, the ability to evict in a timely manner becomes more problematic. And at the end of the day, if the banks now have to take more time to make sure the process is done correctly, expenses are sure to rise. Thus, banks stumbled this week and muted the QE2 rally. Well, I should say the 'QE2 anticipation rally'. Quantitative easing is the operation conducted by the Federal Reserve whereby they buy Treasuries from the big banks. The Fed gets rid of garbage mortgage debt and the banks get billions to lend. Okay, okay - please stop laughing. We all know that the lending model is a failure. The banks use the money to jack the stock indices higher. The rally from August has added more than a trillion dollars to Americans' net worth. Unfortunately, when Wall Street gets on a drug, the eventual withdrawal process is ugly. That drug, is Federal Reserve stimulus like the QE variety. We know the government lies about everything so I don't even pay much attention to 'government data'. Supposedly, the economy lost some jobs last month but gained some jobs in another column. Inflation is up but if you don't count the things that are up in price, inflation is at zero. Sorry, SSN recipients. Consumers were supposedly buying but feeling less confident. The economy added jobs but more people applied for unemployment benefits. In other words, our government could tell the truth if Jesus wrote it on index card for them to read. So let's look at a chart. 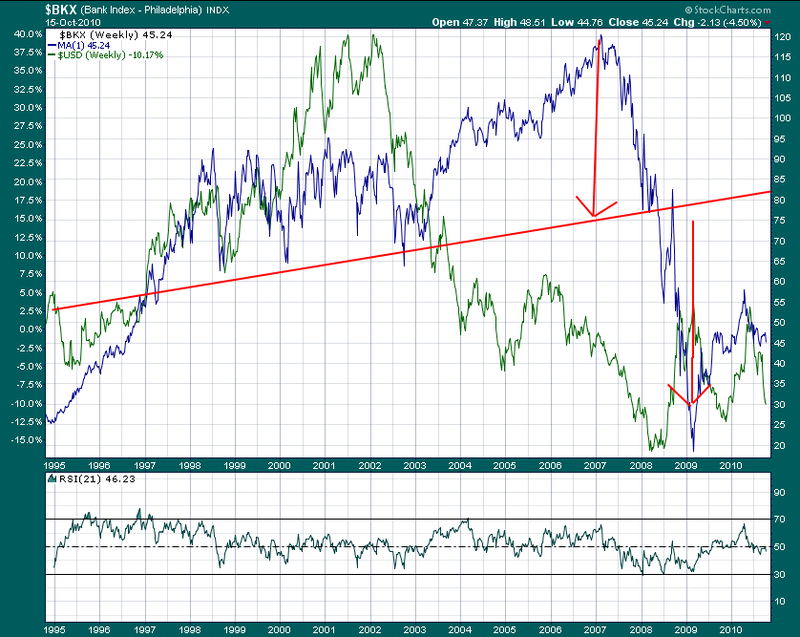 The chart below is a 15-year look at the US dollar in green and the banking ETF, BKX, in blue. The chart of the BKX looks to me to be a double top so I took the liberty of drawing in a neckline in red. The red arrows show the anticipated target low once the neckline is broken. Check. Interestingly, I call 2003 the 'magic year'. Everything changed in 2003. The market was overtaken by the Fed and no longer functioned from that point on. For instance, the BKX and the dollar were pretty well correlated until 2003. Since, they are inversely correlated. 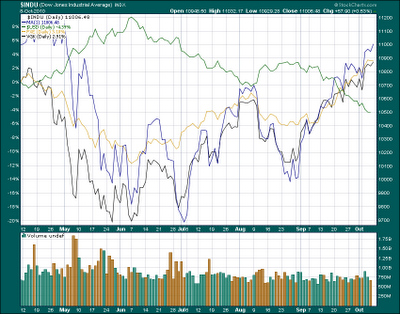 The Fed has made a mess of the indices and life in general. Where do we go from here? The dollar is heavily oversold right now. It is due for a bounce. Thursday and Friday it did indeed bounce. Banks fell. The dollar might bounce some more next week and the week after, but the Fed will soon be back in QE mode which destroys the dollar. Thus, banks might continue falling and the indices might just wallow in the low 11,000 range. But soon, Santa will be back driving the indices higher. Uh, I mean Bernanke will be back driving the indices higher. Just be advised that POMO activities are scheduled frequently in the coming weeks so there should be a few pretty strong days in store for the Dow that will quickly be tempered by the banking mess. Disclaimer: The views discussed in this article are solely the opinion of the writer and have been presented for educational purposes. They are not meant to serve as individual investment advice and should not be taken as such. This is not a solicitation to buy or sell anything. Readers should consult their registered financial representative to determine the suitability of any investment strategies undertaken or implemented. I would suggest we all read what the new leaders have to say and what they want from us. With out a doubt, they want the stock indices higher. The economy is still in a fetal position from the real estate depression so the Fed's only recourse is to inflate, inflate, inflate. Now, for the first time in history, they are even putting their objective in print. They are backing up their words with $30 billion dollar injections into the system each month. Here is what is going on. The Fed has $2 trillion dollars in bad MBS (Mortgage Backed Securities) paper. They obtained the paper by taking $2 trillion dollars from the Treasury and then buying the garbage from the big banks. This expanded the Fed's balance sheet and they are not going to allow it to contract. As the MBS garbage rots and dissolves, they are printing up some $30 billion dollars per month to buy Treasuries from the big banks. That gives the big banks ammunition to buy stocks knowing that another $30 billion is coming next month and another $30 billion is coming after that. The current rally is completely artificial but that's the way a fix works. Back to the Fed. So now the Fed is going to exchange the MBS paper for freshly issued US debt Treasuries. The heist should be completed in a year or so and the Fed will then have $2 trillion in Treasuries. Ain't that swell! But what about the poor old US dollar that they are throwing under the bus? The Fed wants control and owning the debt is control. When they finally kill the dollar, the Fed will no doubt issue some currency that they themselves conjure up. To the rest of us, we can look at the chart below for an insight as to what to expect going forward. 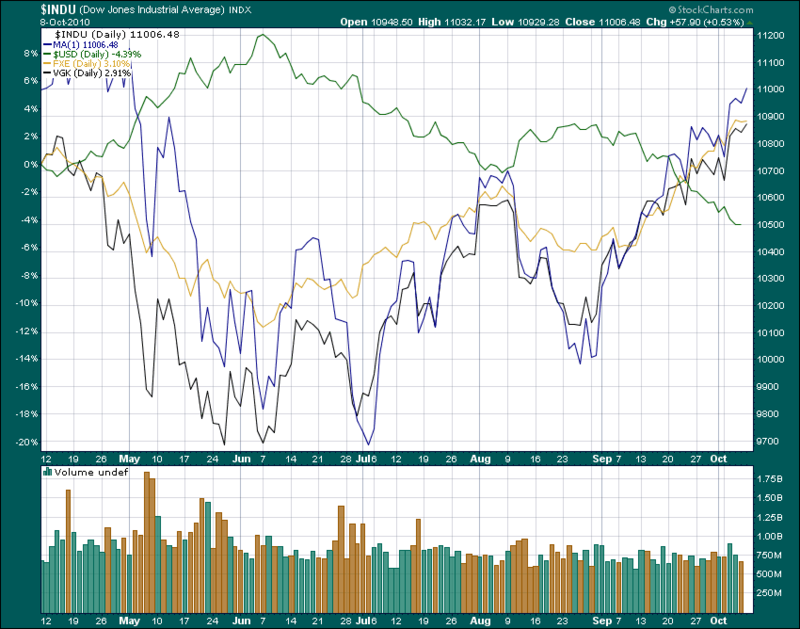 The US dollar is the green line, the Euro currency is the gold line, the Dow is the blue line, and the Euro stock ETF, VGK, is the black line. Very simply, the dollar is inversely moving everything. Since we now know the Fed's full intent is to destroy the dollar, we can assume that other asset classes will be inflated. Enjoy the 'rally'! Isaac Newton gave us a fundamental law of physics. Every action has an equal and opposite reaction. In the investment world, currency is the action. Since the US is still the biggest economic player, the US dollar moves everything. Some things have the same action as the dollar. Others are the opposite reaction of the change in the value of the dollar. Like it or not, commodities like oil and sugar rise in price when the dollar drops in value. Commodities are the reaction of the currency trend action. We can make the same analogy with gold and silver. As the dollar falls, gold and silver rise. 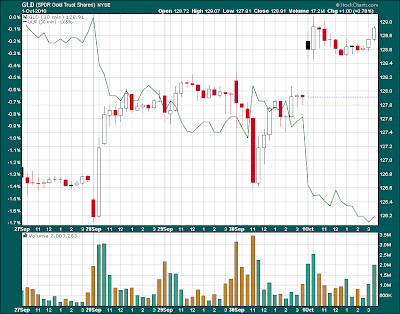 The chart this week shows the relationship of the intraday trading for the week with the US dollar represented by the green line (the ETF UUP) and the gold ETF, GLD, represented with the candlestick line. They are opposite action and reaction. The only question is whether or not gold is in a bubble. The answer is gold is not in a bubble as long as the dollar continues to lose value. Ditto for silver. Now we have to ponder the trend of the dollar going forward. On that question, there seems to be unanimous agreement that the Federal Reserve is determined to drive the dollar down and finish off the job they started in 1913. They have already embarked on quantitative easy that is nothing more than creating dollars from thin air to buy Treasuries from shill banks who then put the dollars into the indices. The Fed continues to talk QE and from their meeting last week, they have even offered the prospect of deflation as an excuse to inject more cash. 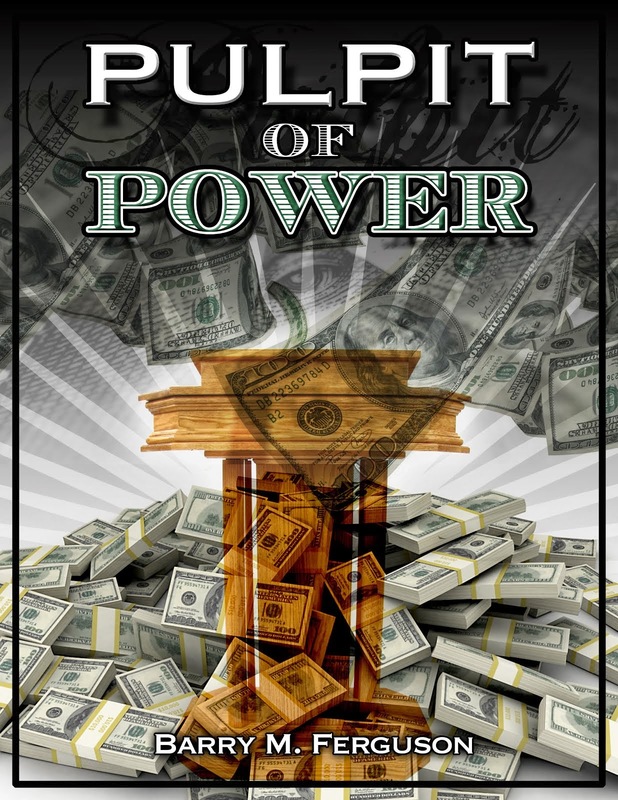 Coupled with tens of trillions of debt and a Congress spending money like a drunken sailer at a strip bar, there seems to be no end to the amount of currency that has been, and will be, created. This is inflation and not deflation. The Fed just lies about deflation so they will have an excuse to print more dollars. Why do they do this? Their only mission is to manipulate the indices and thereby assist their shill banks in dominance and control. Very simply, they are here to take everything we've got. Right now they are confiscating our real estate. The health care tax is a confiscation of our medical treatment. They will soon confiscate our retirement accounts. They know that they can use the stock indices as a ruse to dupe the dopes into thinking all is well and that the Fed is here to help. In real terms, the US dollar has lost more than 50% of its value since 2001 while the Dow has remained at the same level of ten years ago - 10800. The truth is the Dow has lost 50% in terms of purchasing power. To say, or think, that the Dow is holding its own is a ruse. To that point, the Fed has completely taken over the stock indexes and manipulates them every day. To stave off a complete and cataclysmic real estate collapse, the Fed has taken on the task of manipulating the Treasury yields lower by buying them up like a fat man at a doughnut shop. They are using POMOs, REPOs, and QEs while at the same time, they are extending the use of derivatives that are supported by Treasury collateral. They have also advanced their lying campaign to include the ridiculous idea of deflation which also induces investors to buy more Treasuries. I think Treasuries are a good buy but not because there is inflation. They are a good buy because the man with the golden printing press is buying them. Yes, the Dow can be inflated like commodities. 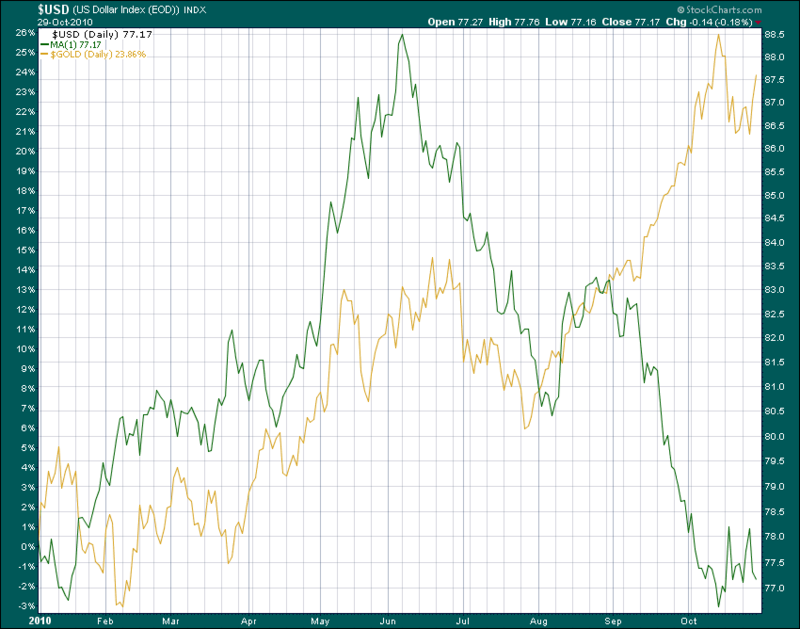 A quick look at the chart shows a microscopic one-week view of the dollar and gold. The question of a trend can therefore be answered. As long as the Fed continues to destroy the dollar, gold and silver both can be considered to be following an inverse trend reaction to the dollar devaluation action and not in bubble territory. This is how deflating dollars can be turned into inflating gold! Disclaimer: The views discussed in this article are solely the opinion of the writer and have been presented for discussion and education purposes only. They are not meant to serve as individual investment advice and should not be taken as such. This is not a solicitation to buy or sell anything. Readers should consult their registered financial representative to determine the suitability of any investment strategies undertaken or implemented. BMF Investments, Inc. assumes no responsibility for any gains or losses incurred as a result of any action taken from this article. All articles published on this site are the opinion of the writer, Barry M. Ferguson, and are intended solely for discussion and education. Nothing herein should be construed as an offer to sell anything nor as individual investment advice. Every investors' situation is different and as such, should consult directly with a professional advisor before buying or selling any position in any security. Any decisions made from any information from this blog are done entirely at the readers own risk. BMF Investments, Inc. assumes no responsibility for non-clients.